GUARANTEED best rates on ALL currency. Call for better rates on bulk exchange. The easy and secure way to exchange foreign coins and notes instantly! CLICK 'Change Coins' below to exchange NOW! The simple and secure way for businesses, banks and charities to exchange foreign coins and banknotes! Simply package up your foreign coins and banknotes as per our packing instructions. Your currency is then securely collected. Finally all your foreign coins and notes are sorted and counted for instant payment by bank transfer. It’s that simple! You may have found you cannot exchange foreign coins and low denomination banknotes at banks and bureau de change. Which means you’re left with worthless currency. This currency need not go to waste – we work with charities, businesses, banks and public sector organisations to exchange foreign coins and banknotes. Our service is so quick and easy, you’ll be amazed you didn’t find out about it sooner. We’ve even produced a video with a step by step guide to show you. Video on how to exchange foreign coins. We even accept pre-decimal UK and Irish coins, as well as pre-euro European currency. The great news is that we offer INSTANT ELECTRONIC PAYMENT and we GUARANTEE you the BEST OFFER for your currency in the UK. We help lots of hospitals, charities, businesses, banks and public sector organisations raise thousands with foreign coin and note collections – It’s perfect for fundraising too. We exchange ALL pre euro coins and notes as well as other currencies such as Spanish Pesetas, Euros, German Deutsche Marks and Swiss Francs – we even accept old British and Irish Coins and notes. As leaders in our field, we pride ourselves in our quick turnaround and customer-focused service. Don’t just take our word for it. Customers just like you regularly contact us to thank us for our fast and friendly service. We simply won’t be beaten on price in the UK and guarantee you the best offer for your currency on every transaction. If you have a large collection of coins weighing 10kg or more, we’ll send a secure courier to collect them for you FREE of charge! Your package will be fully tracked and insured for your complete peace of mind. For weights between 5 and 10 kg we use the ‘Hermes’ courier network. For convenience, you can take your currency to a local ‘Hermes’ location who will then send to us via secure courier. Contact us to find your local drop-off point. As a commercial processor of coins and notes the minimum weight of currency we accept for payment is 5kg. However, if you have less than 5kg and would like to donate your currency to any charity of your choice then we will accept it only on the basis that this will be donated (by us) to charity. For advice on sending under 5kg please call us on 0161 635 0000. Once converted and donated to the charity of your choice the official donation reference number will be emailed to you. When it comes to currency, we understand that you need a reliable, honest and professional service. But we’re not happy with simply meeting our customers’ expectations; we like to exceed them. So much so that we offer a 100% total satisfaction guarantee – or we’ll return your currency at our own cost. For your peace of mind our activities are regulated by HM Revenue & Customs. We are also proud to be a member of the IBNS, the International Bank Note Society. Every part of our service is tailored to you, the customer. We aim to provide the smoothest, easiest way for you to exchange foreign coins into usable funds – as quickly as possible. With a diverse range of regular clients including banks, charities, airports, public sector and businesses, our customers benefit from the knowledge that we come highly-recommended. Just take a look at our testimonials! Foreign coin exchange is a quick and easy fundraising idea for your local school, charity, hospital or club. We’re on hand to help and guide you. With a dedicated fund-raising team at your disposal, we can help you plan, organise and maximise your collection, to make your campaign an ever greater success than you hoped. Of course, there’s more to what we do than we can put on a single web page, so if you have any doubts or questions, don’t hesitate to get in touch with our team. 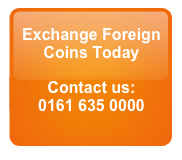 We’d love to help you exchange foreign coins today. If you’d like to read more about the different types of foreign coins and banknotes that we exchange then click here.